Looking for a delicious appetizer? 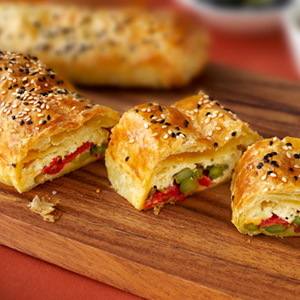 Just listen to this...bundles of asparagus with roasted red peppers and a creamy filling, wrapped in golden puff pastry. Trust us, they taste even better than they sound. Heat the oven to 400°F. Stir the cream cheese, Parmesan cheese, black pepper and garlic powder in a medium bowl until the mixture is smooth. Sprinkle the work surface with the flour. Unfold the pastry sheet on the work surface. Roll the pastry sheet into a 12 x 9-inch rectangle. With the short side facing you, cut the rectangle in half lengthwise. Spread about 1/2 cup cream cheese mixture on each rectangle to within 2 inches of the edge. 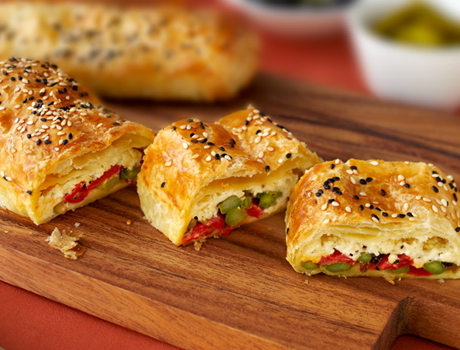 Divide the asparagus and roasted peppers between the pastry rectangles. Fold the long sides of the pastry over the filling and press to seal. Place the pastries, seam-side down, onto a baking sheet. Press the ends to seal. Brush the pastries with the egg and sprinkle with the sesame seeds. Bake for 20 minutes or until the pastries are golden brown. Let the pastries cook on the baking sheet on a wire rack for 10 minutes. Cut each pastry into 6 slices.